Aspen ParkRun volunteers ham it up during one of the races. It’s a little before 8 o’clock on Saturday morning at Iselin Field by the Aspen Recreation Center, where a handful of runners, and maybe as many volunteers, have gathered once again. They’re here for another edition of the Aspen ParkRun, a 5-kilometer footrace that debuted locally in April. The ParkRun is hardly on the level of Aspen’s more high-profile races such as the Buddy 5-Mile held July Fourth, the Aspen Valley Marathon in July, or the Golden Leaf Half-Marathon in September. It doesn’t want to be, either. Yes, it’s free. Forget paying those race fees that can eclipse $100 these days. Sure, you won’t haul in the schwag that comes with a race fee, such as T-shirts, coffee mugs or a granola bar sample. All that’s needed to enter the race is a participation tag, which runners can receive by registering on the event website. But waiting for the runners at the finish line are complimentary donuts and coffee provided by Limelight Hotel. Forget about a participation medal or age-group ribbon, but high-fives from the volunteers are aplenty. 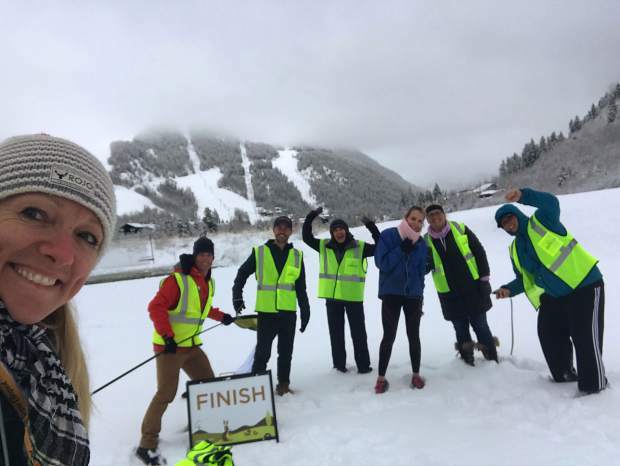 Volunteering is just as important to the race as the runners themselves, noted Englishman Matthew Shaw, who has done ParkRuns all over the world, including Aspen. ParkRuns are spread over Asia, Australia, Canada Europe, New Zealand, South Africa, the U.S. and other global spots. Shaw has raced ParkRuns, which is a network of free 5Ks, that have attracted upward of 300 participants. The Roy couple, who moved to Aspen from Australia, where they raced in ParkRuns, thought it would be a good idea to try the concept here. They won over the city of Aspen and established an out-and-back race course that starts and finishes at Iselin. The course takes harriers over the pedestrian bridge by the ARC to the Aspen schools campus, then down the blacktop trail through the Marolt Open Space before turning around at the east end of the Marolt pedestrian bridge. As far as 5K paved courses go, the Aspen ParkRun course presents a formidable challenge. The first mile and a half might seem like a breeze given the elevation drop of nearly 200 feet, but the last half makes up for that with the gradual uphill climb back home. The difficulty is reflected by the fastest times posted so far this year; just three males have cracked the 21-minute barrier, while one woman has broken 22 minutes. While the Aspen ParkRun has the highest altitude among all ParkRuns, its turnouts have been low. Its biggest showing was 21 participants on April 7; last Saturday’s race drew two runners. Roy said he the ideal number is about 50. He said organizers hope to eventually move the race to the Rio Grande Trail. He also noted the event has drawn runners from far-away places who have run ParkRuns elsewhere. Shaw, who has visited Colorado for 30 years, has finished 87 ParkRuns. He plans to have completed his 100th ParkRun by his 60th birthday in January. The perks of regularly running it come in the form of camaraderie with the other participants and volunteers. Plus, runners can check their progress and see how they stack up with other ParkRun contestants on the event’s website. 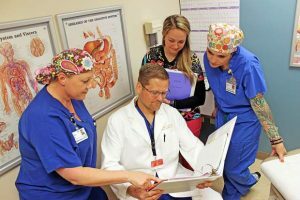 “Whether you are competitive, or it’s for your health, or you want to lose some weight and get some exercise” are some of the reasons he’s a big supporter. The Roys said they don’t know if the event will continue into the winter months, but it at least will go through the end of November. If they do close it down for the winter, Jason Roy said he hopes to it returns in April. Organizers also have been mindful about the race clashing with other local events. ParkRuns weren’t held during the Aspen Valley Marathon or the Golden Leaf, for example, to avoid any conflicts.